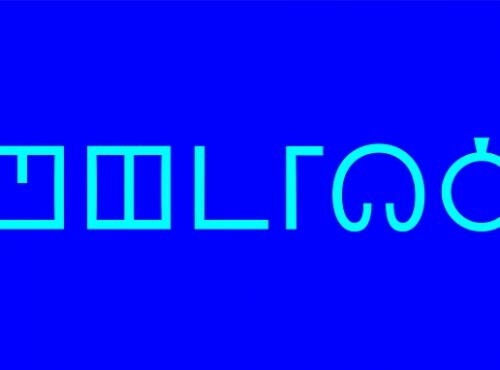 Somerset House is currently home to UTOPIA 2016: A year of artists, designers, provocateurs and thinkers experimenting with ways we might live, make, work and play. 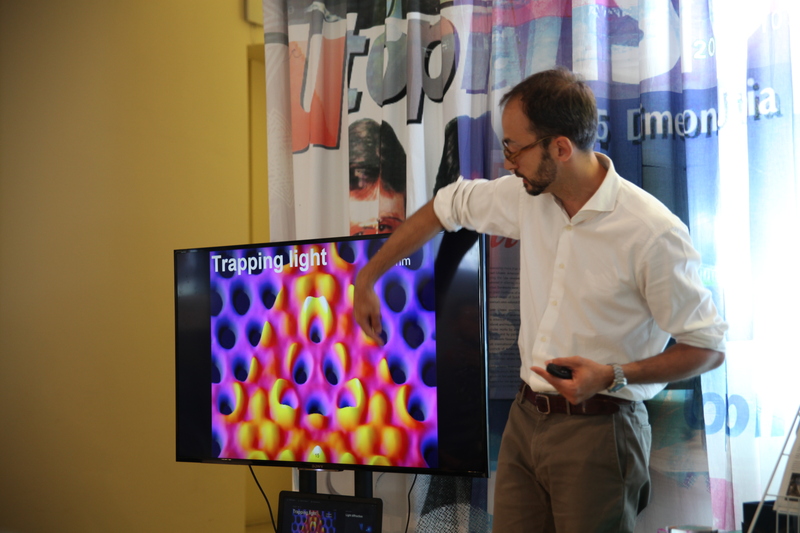 Last week Reactive Plasmonics co-investigator Riccardo Sapinenza gave a talk at Utopia entitled ‘Light and Glass from Roman glass to nanophotonics’. 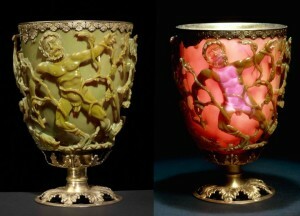 Riccardo began his talk by discussing the Lycurgus Cup, a 4th-century Roman glass cage cup made of stained glass. 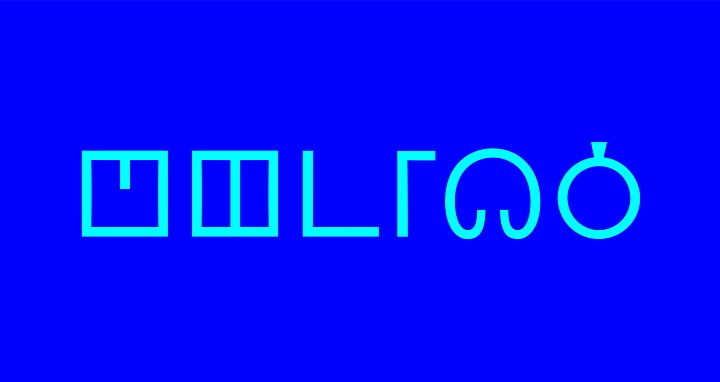 It shows a different colour depending on whether light is passing through it or is reflected from it. It is red when it is lit from behind and green when lit from the front. It is thought to be the only remaining Roman object made from this type of glass and is likely that this nanophotonic-based technique came about as a series of fortunate accidents. What is light? Light is an electromagnetic radiation within a certain portion of the electromagnetic spectrum. Light is emitted and absorbed in tiny energy packets called ‘photons’. Optics is a branch of physics which involves the behaviours and properties of light and its interactions with matter. In the example of the Lycurgus Cup the matter is glass and small metallic nanoparticles. What is colour? A pigment is a material that changes the colour of reflected or transmitted light as the result of wavelength-selective absorption (e.g. Paint, dyes etc). If you mix lots of pigments together the resulting colour would be very dark brown or black. Structural colouration is the production of colour by microscopically structured surfaces fine enough to induce interference of visible light (the iridescence in bird’s feathers is structural). If you mix lots of structural colour the resulting colour would be white. Light interacting with silver and gold nano-particles of different shapes embedded in the glass allows the Lycurgus Cup to change from Green to Red. Control of light-matter interaction has led to many different scientific breakthroughs including technology used in solar cells and optical computing, this is something that the Roman’s accidentally discovered which has now grown into a large area of research. 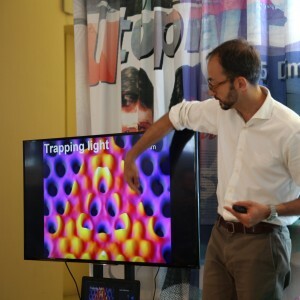 Riccardo’s main scientific interest is nanophotonics and in particular the coherent interaction of light with mesoscopic and nanoscale photonic systems, individually and collectively. It involves a combination of nano-optics, quantum optics and photonics of complex systems. More information can be found on his website.